Waterbury Clock Co. large Cabinet clock called, "Washington", ca 1891. The clock is much larger than the catalog pictures depict. It is27 inches high and 19 inches wide. That is a big mantle clock. 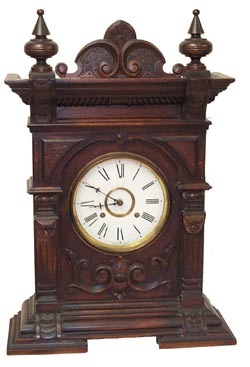 An attractive dark oak case with original finish, all trim parts and pieces are in place and the finials are original. The case is elaborately carved on 3 sides. Ithas the original glass, or at least an old glass. There is a good, no hairlines;porcelain dial signed Waterbury, and old, if not original, hands. The 8 day, half hour striking Waterbury "star" movement is clean and running and strikeson a standing coil gong giving off a pleasing mellow sound. Ly-Waterbury No. 812shows this clock with a visible escapement and a silvered dial, however, thereis nothing to make me believe that this movement and dial did not start lifein this case. This is one you would like to keep.